Ardownie Quarry is located about 2 kilometers north of Monifieth near Dundee off the A92 coastal road to Arbroath. It is operated by the Geddes Ltd group of quarries. The rocks of this area are predominantly andesitic lavas belonging to the Ochil Volcanic Formation overlain by sandstone’s of Lower Devonian age dated at around 400 Ma. I first heard that some nice agates were coming from Ardownie Quarry in the summer of 1992. After seeking permission to go into the quarry, I first visited there on the 24th June 1992 with another collector friend of mine. During the winter months of 1992 into 1993 I visited as often as I could trying to time my visits after blasting operations might have exposed more material. 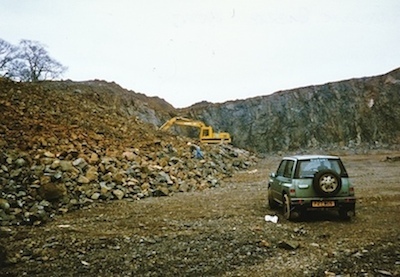 After this initial period I tried to visit the quarry as often as I could until about 1996. 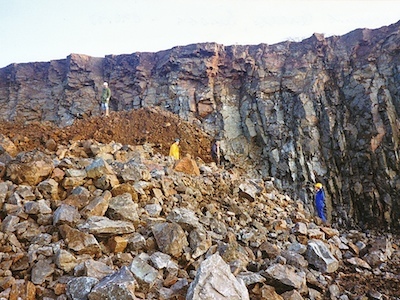 At that time quarrying operations on the agate-bearing area had been suspended and have not since restarted due to the proximity of a road nearby. The heap of material after the blast....hard work picking over it all? The "feeding frenzie"....getting "stuck in"! Having visited the locality many times over a few years, I got to know some of the managers and staff including a chap who used to work on the crushing plant. James told me some amazing stories of large agates, amethyst and smoky quartz geodes “exploding” as they went into the crusher. He also had a very impressive collection of some beautiful, but fragmented, agates and geodes in his office at the crushing plant. Initially we spent most of our time extracting specimens from the lower layers of the lava flow but eventually more exploration showed us that there were also some beautiful agates in the upper parts of the flow. The agates therefore fall into two main categories. Those from the upper oxidized area of the lava flow are predominantly beautifully coloured mostly in pink or red shades, while those from the deeper unaltered layers are typically blue-black with crisp white fortification banding some up to 200mm across. 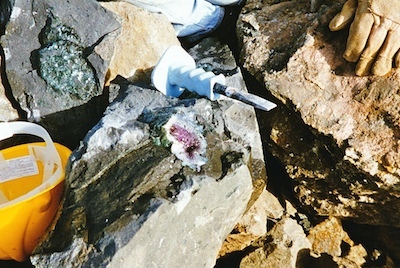 Some from the lower area contained amethyst or smoky quartz centers and agates from both areas sometimes contain large calcite crystals embedded in the chalcedony. Agates with more vivid colouration from lava flows near, and float material upon, the ground surface have also been noted at other sites possibly reflecting the intrusion of iron-rich solutions into porous agate structures in the more accessible stones. The agates from Ardownie were generally of a much larger size than anything previously found and occurred in profusion as uncracked perfect examples. In addition to the large numbers of extraordinary agates, numerous large geodes containing amethyst crystals provided alternative and highly sought after finds some up to 300mm across. Many nodules also contained high quality green and red moss agates, which, once worked provided exquisite cabochons. 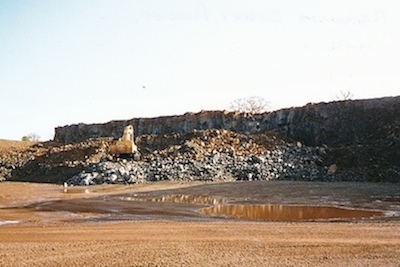 The agate-bearing area of rock at Ardownie was confined to an amygdaloidal rich horizon exposed in only one section of the south side of the quarry wall and was actively worked from about June 1992 to April 1993. Despite not being actively worked after that period hard work would always reward the patient collector prepared to look over the older heaps. Examination of the quarry face suggested that agates occurred at the top of one continuous lava flow between 45 and 50 metres in depth. The greatest proportion of the amygdales occurred near the top of this lava flow. Regular blasting during this “bonanza” period frequently exposed new agate-rich lava, until the quarry boundary was reached on the southern edge. At this point the land falls away towards the Tay and many agates were actually found loose in the overburden above the lava exposure. It therefore seems likely that the rock that was quarried represented only a small remaining portion of a much larger lava flow, the bulk of which has been removed by natural erosive processes of a long period. I feel that I was very privileged to have been able to collect and visit this site in the short time it was productive. As a consequence I have amassed a large and representative collection of beautiful agates and geodes from here that I certainly feel equal, if not surpass, the quality of those from the fabled “Blue Hole” that was reported to be near Usan further up the coast. In fact my theory on the location of the “Blue Hole” places the source of those agates in an area that was heavily “quarried” in a similar manner to Ardownie only nearer Montrose than others have suggested! 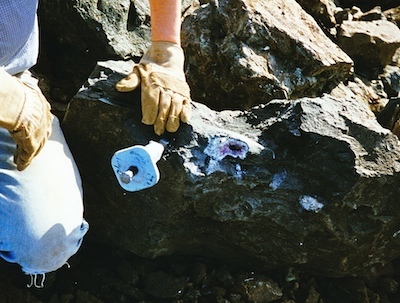 Extracting some amethyst lined geodes in the summer of 1993.